The Penn State Icers are on the right track as they head to their 20th consecutive National Tournament appearance after taking two lopsided victories from the Rutgers Scarlet Knights on the final weekend of the 2010-11 season. With no disrespect to Rutgers, it should come as no surprise that the Icers won by 9-2 and 10-2 margins. Team speed and depth were the keys to the wins - both will be needed if the Icers hope to get past Rhode Island in next Saturday's tournament opener. The line of Chris Pronchik, Joe Zitarelli and Mike Broccolo continued their red-hot play on Saturday. After combining for 11 points in Friday's win, the trio added 6 more points in the weekend finale. Pronchik finished his regular season career with two assists on Saturday and a goal and three helpers on Friday, Zitarelli had two goals on Saturday to go with his four assists on Friday, while Broccolo counted two assists Saturday after scoring twice and adding an assist on Friday. Ted Hume was solid on Saturday, stopping 23 of 25 shots. His performance is a good sign heading to the tournament - giving the Icers a solid one-two tandem with Ted and Mathew Madrazo. I misspoke at the end of Saturday's webcast, only crediting Teddy with 58 career victories instead of 59. The only downside of the weekend was the injury to Paul Daley in Friday's win. Hopefully, the gritty junior will be cleared to play next weekend. If not, the coaches will have plenty of able bodies to take his place. Congratulations to the senior class for all they've accomplished of the past four years. Let's hope that they will cap their careers at Penn State by bringing the Murdoch Cup back to where it belongs. The Penn State Icers were firing on all cylinders on Friday night, rolling over Rutgers by a score of 9-2 in the second-to-last game of the 2010-11 regular season. It was a milestone night and a night for some outstanding performances across the board. Tim O'Brien recorded 3 assists, his 199th, 200th and 201st career points. Tim becomes just the 15th Icer to reach the 200-point plateau. Timmy's 3 helpers all came on goals by Chris Cerutti. For Chris, it was his 5th career hat-trick and second of the season. George Saad, Brian Dolan (who has blossomed into a solid 2-way defenseman late in the season) and Kevin Miller all scored. I'm reserving special kudos for the line of Chris Pronchik, Joe Zitarelli and Mike Broccolo and goaltender John Jay. Pronchik, Zitarelli and Broccolo combined for 11 points on the night - Chris gained third-star honors with a goal and three assists, Joe notched 4 assists and Mike scored his third and fourth goals of the year and added an assist. John has been the forgotten member of the four-goalie rotation, making his first start of the year and just his second appearance. J-J turned aside 19 shots for the win. Assuming fellow senior Ted Hume gets the start this afternoon, John will finish his Icers career with a perfect 10-0 record, 1 shutout and a miniscule 1.85 goals against average. The senior class will be honored before today's final game of the season. Hopefully, the technical gremlins will leave us alone, allowing you to enjoy our final webcast of the season. Speaking of gremlins, You Tube is taking over two hours to upload a four minute highlight video. Hopefully, I'll get it posted later today. I can't think of a better way of putting it than how the kids put it. Simply put, the atmosphere in the HSBC Center tonight is electric as the Pegula Era begins with the Sabres facing the Atlanta Thrashers. Chants of "Terry, Terry" and a standing ovation as Terry Pegula and his sons walked out onto the ice during the opening ceremonies. The fans going berserk when The French Connection line of Gil Perreault, Rene Robert and Richard Martin skated onto the ice. A sign above the last row of seats that said, "In Terry We Trust." If you were lucky enough to see it tonight, you have an idea of how it will be on the opening night of the Pegula Ice Arena. Here's some photos taken from my perch in the Ted Darling Memorial Press Box. Enjoy! Kyle Rossi, this one's for you! Day two in Buffalo with JoeBa started with checking out the morning skate prior to tonight's Sabres - Thrashers contest. I had the chance to talk to former Michigan State goalie Ryan Miller. The interview was done on my cell phone, so the quality isn't the greatest. Serves me right for leaving the charger for the video camera sitting on my desk. I tried to convert Miller from Spartan green to Nittany Lion blue, but the Sabres star wasn't budging! The atmosphere at the HSBC Center tonight will be electric. Terry Pegula will drop the ceremonial puck drop and the word is the French Connection may be in the house. The buzz in Buffalo today was reminiscent of the buzz in Happy Valley last September as Terry Pegula was introduced as the fourth owner of the Buffalo Sabres. I had the pleasure of joining Joe Battista on the journey to Western New York to attend the press conference and Wednesday's game between the Sabres and the Atlanta Thrashers (another team that could soon be on the auction block). The presser was the lead news on the local morning newscasts, the front page of the Buffalo News and other local papers and, of course, the only topic on the sports radio stations. All of the local TV stations carried the press conference live, giving you an idea of how big hockey is here in the Queen City. 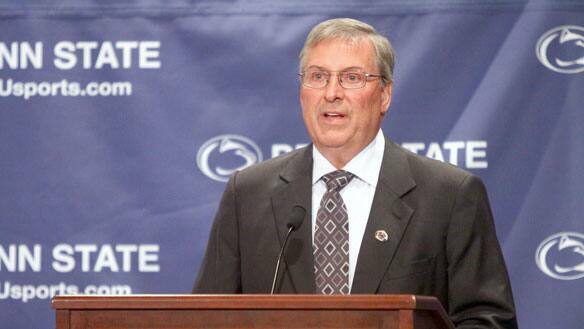 All of us associated with the Icers know of the passion that Mr. Pegula has for hockey. Today, he showed that passion to the Sabres faithful. His emotional introduction of his family, as well as Sabres legend Gilbert Perreault and other Sabres alumni, spoke volumes. Recounting how he listened to Sabres broadcasts while living in Houston and Pittsburgh in the days before internet broadcasts showed how devoted he is to the Sabres. In September, Terry said he wants Penn State to be on a fast-track to the Frozen Four. Today, he said he wants to win Stanley Cups - lots of them. I wonder what the over/under is on which comes first? Here's a sampling of what our favorite member of the Icers family had to say, as well as my allotted one minute with NHL Commissioner Gary Bettman. The National Hockey League (NHL) today announced a major agreement with brewers Molson Coors (NYSE: TAP) in Canada and MillerCoors in the U.S.,awarding flagship brand Molson Canadian exclusive League rights in the beer sponsorship category, including the rights to the Official Beer of the NHL® designation, beginning with the 2011-12 NHL season. The deal will span seven years. 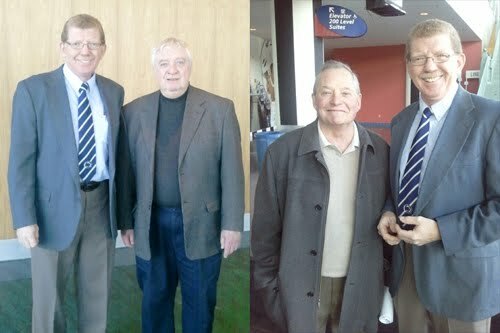 Lastly, I had the opportunity to meet a couple of the legendary NHL broadcasters, Rick Jeanneret and Harry Neale. CBC Sports is reporting that the sale of the Buffalo Sabres to Terry Pegula will close on Tuesday. Terry Pegula will formally close on his $189 million US purchase of the Buffalo Sabres on Tuesday, a little over three months after the Pennsylvania billionaire first approached Tom Golisano to purchase the franchise. Pegula, who has declined comment during the purchase process, will then hold his first news conference as owner on Tuesday morning. He will be joined by NHL commissioner Gary Bettman. The Sabres provided the update on Monday, adding that Pegula will have no further comment. The closing of the sale is the last step in Pegula's purchase after the NHL board of governors approved the sale last week. Pegula was scheduled to inspect and tour HSBC Arena on Monday. To say the least, it was a frustrating weekend on so many levels. Let's start with the obvious - the one-and-done 3-1 loss to Delaware on Saturday afternoon. The game result speaks for itself - especially since our technical problems with the webcast didn't allow me to record the game. But - unless you're a Blue Hens fan, you probably don't want to see anything from the one-sided affair. Needless to say, the performance by the Icers has raised concerns with less than two weeks until they open the National Tournament against Rhode Island. Congrats to Joe Augustine and the Rams for their come-from-behind win over Delaware in today's championship game on their home ice. Kyle Rossi has the details of the game on his Thank You Terry blog. Three Icers captured conference honors. Tim O'Brien was named first-team all-ESCHL, while George Saad was named winner of the ESCHL Sportsmanship Award. Goaltender Mathew Madrazo was named as a member of the second all-tournament team for his outstanding play on Saturday. Our technical glitches added to the frustration for you all, I'm sure. Despite a hard-wired connection to the internet at the Boss Arena (thanks to arena manager Tracy Piacente and her staff) the video stream wasn't the best quality and we lost the audio on my interview with Tim O'Brien. It must be something about Rhode Island and the internet that bedevils us. The wifi at our hotel even caused me fits - cutting out every minute or two - so much so that I gave up trying to post a blog last night and waited until we got home tonight. The weather was bizarre - from 60-plus degrees when we arrived in Rhody on Friday to gale-force winds on Saturday and temperatures in the teens when we left this morning. Fortunately, the drive home was under sunny skies, but we were held up by two different accidents involving semis - one in New Jersey and the second on I-80 in the Poconos. Hopefully, the drivers of both vehicles survived a couple of nasty wrecks. Just back from a trip to the dentist and I see that Kyle Rossi has the opening round matchups for the 20th ACHA National Championships on his blog. As I said earlier, it's going to be a tough road for the Icers if they hope to make it through the early rounds to the finals on Wed., March 9. Penn State is seeded 10th, and will open against ESCHL rival and conference regular season champion Rhode Island. The Icers and Rams will do battle on the Gold rink at the University of Delaware. The secondary rink is NHL size, unlike the Rust Arena's Olympic-size surface where the Icers battle the Blue Hens annually. Game time is set for 2:00 pm on Sat., March 5. There's the potential for another meeting with Rhody this weekend at the ESCHL Tournament in South Kingstown. The Icers face Delaware in the opening game at 4 pm on Saturday. The Rams will get either Robert Morris or West Chester, with the winners meeting Sunday at 1 for the conference title. The Icers are 1-2-1 against Rhody this season, losing two at the Boss Arena, winning the first of two at the Greenberg two weekends ago before dropping a shootout loss on Alumni Day. If the Icers are able to knock off the Rams in Newark, they'll come up against the winner of the Davenport - Rutgers game. As I said earlier today, it's likely that the Icers would have to go through Davenport AND Lindenwood to make it to the final. All games at the tournament will be streamed on FastHockey.com. I'll have full information on the cost to view the tournament games as soon as I receive it. The Penn State Icers breathed a collective sigh of relief this morning as the ACHA announced the teams heading to Newark, Delaware next month. The Icers' opening round opponent is yet to be determined. We'll have all of the opening round matchups when they are released. If there's no change in this list, the Icers would open against #7 Rhode Island and could face #2 Davenport and two-time defending champ Lindenwood in the quarter and semi-finals. Certainly, the Icers face a tough road to the title game. Congrats, boys - now go to Rhody and win another ESCHL crown! UPDATE: I spoke Tuesday, before the release of the final rankings, with a rather circumspect assistant coach Josh Hand. Josh said both he and Scott Balboni know the Icers will have to get better before the tournament, starting with this weekend's ESCHL tourney. This line from Collegian writer Tony Barton following Saturday's 8-5 spanking by Robert Morris caught me by surprise. Senior forward Tim O’Brien has a message for all the casual Penn State Icers fans whom watched the two-game split with Robert Morris (Pa.) this weekend. “Look at special teams,” said a distraught O’Brien following Penn State’s 8-5 loss Saturday. In the four years I've watched Tim play here at Penn State, I can honestly say that I've never seen him "distraught." I don't think I've even seen him nonplussed, perturbed, or aggravated. Truth is, Tim has always appeared to be one of those guys that is bothered by nothing -- at least until today. He, and the rest of the team, know that they dropped a big stinker on Saturday against a team they had manhandled at their barn a month ago. A couple of the guys asked me if I thought the weekend could have cost them a spot in the national tournament - one wondered if some coaches would have enough of a bias against PSU to vote them out of a spot. Finally, today - get well soon wishes to Webmaster and PA Announcer extraordinaire Rodney Martin. The Rodman had some outpatient surgery today, but will be on crutches for a few weeks. Since there's no injured reserve list for PA announcers, I suspect Rodney will be in his usual spot when the Icers wrap up the regular season two weekends from now. Now that You Tube has finally cooperated, I'll simply let the video evidence tell the tale of the weekend. It is said that beauty is in the eye of the beholder. Last night's Icers - Colonials tilt at the Greenberg wasn't ugly on the scale of the Penguins - Islanders slugfest, but it won't rank high on anyone's list of impressive Penn State victories. Despite the fact that the Icers looked lost at times, they managed to secure a 6-4 victory and in the process solidified their position in the pecking order at the national tournament. The win, and losses by #9 Oklahoma (6-2 to Illinois), #10 Oakland (7-2 to Davenport) and #12 Iowa State (6-2 to Lindenwood) could propel the Icers up a spot or perhaps two in the final rankings that will be released next Friday. Paul Daley led the way with a hat trick, matching the three-spot put up by Brian Chiavetta for Bobby Mo. Rich and Tim O'Brien and Eric Steinour adding the other goals. Tim and Eric returned to the lineup after their stint with Team USA, helping to nullify the absence of Chris Cerutti due to injury. Kevin Miller returned to the lineup against his old team after rehabbing his foot injury. Brian Dolan continued to impress on the blueline, where he was again paired with Carey Bell. Brian garnered third-star honors for the second Friday in a row with another solid two-way effort. While a win is a win - to be blunt - the Icers will have to be much more consistent if they hope to make some noise at the big dance in March. Note: Highlight video to follow. You Tube is taking close to three hours to upload a 5 minute video! I caught up with assistant coach Josh Hand on Tuesday, but due to a combination of factors (including an internet outage this morning) I'm only now able to get our chat posted. Josh did a great job guiding the team while Scott Balboni was in Turkey as an assistant coach with Team USA. Scott, Tim O'Brien and Eric Steinour are back home. As a result, there will likely be some roster changes for this weekend's home series against the Robert Morris Colonials. The Icers will be gunning for a season sweep of Bobby Mo, which should ensure their ticket to the national tournament. Rodney Martin has an analysis of the "Bubble Watch" on the Icers website. I mistakenly said that #10 Oakland faces top-ranked Lindenwood this weekend. In fact, the Golden Grizzlies will battle #2 Davenport, which is no easy feat either. It's #12 Iowa State that visits the two-time defending champs, which could help the Icers as well. The Alumni Weekend results weren't exactly as the Icers and their fans had hoped for, but you wouldn't know it by being at the team's practice on Tuesday. It was readily evident that the confidence level is at a season high, despite dropping Saturday's game to Rhode Island in a 5-4 shootout. Penn State battled the Rams in both games, getting key contributions from the likes of freshman Andrew Duval. Andrew was inserted into the lineup to replace the injured Mike Longo. The Westminster, Colorado native stepped up, scoring the game winner on Friday night, his first goal in a Penn State uniform. Fellow freshman Mike McDonagh has also contributed in the absence of Eric Steinour over the past three weeks. The pride of Wilmington, Mass. has been playing on a line with Paul Daley and Dom Morrone. The trio combined for 4 goals and 5 assists in the two-game series. I wrote on Sunday morning that the Icers deserved a lot of credit for "battling back every time Rhody took a lead." Unfortunately, Penn State was unable to get the go-ahead goal against Rhode Island and the Icers couldn't find a way to solve Rhody goalie Paul Kenny in the shootout. Rhode Island's Dave Macalino was the only shooter able to beat Matthew Madrazo, giving the Rams a 5-4 win and spoiling the outcome of the Icers' alumni day game. Now, the Icers have to prep for Robert Morris. The Icers took two from the Colonials last month. 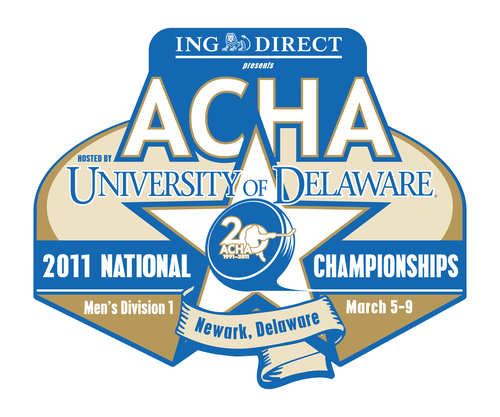 If they repeat that feat this weekend, they should secure their spot in the 20th annual ACHA national tournament. The ticket to the dance likely will be easier to obtain after 10th-ranked Oakland was swept by #9 Oklahoma. The Golden Grizzlies face the tougher road, having to take on #1 Lindenwood this coming weekend. We Are - Penn State Hockey! When Joe Battista showed me this video a couple of weeks ago, all that I could say was, "WOW!" Icers alumnus Michael Messner, through his Pittsburgh-based Mind Over Media company, put together this promo video that was officially unveiled at last night's alumni dinner. To say that it brought the house down is a gross understatement. In fact, it was played twice, and received a standing ovation. The video promotes Penn State hockey, but it is much more than a promo video. In just over three minutes it says all that needs to be said about why this entity that we call the Icers Family is so special, and why the bonds within the family run so deep. To have so many alumni travel so far in miserable conditions is testament to how tight the bond is between those players. Mike's video is just one of a number of highlights from a day and a night that spawned a wide range of emotions. Emotions ran high when it was announced that 90-year old John Dufford wants to be the first person to skate on the ice of the Pegula Ice Arena. Knowing John, he'll be ready to lace them up in the fall of 2013. There was a steady stream of alumni and family members thanking Terry and Kim Pegula for making the dream come true. The Pegulas were presented with two special gifts that will play a prominent role in the future. One of the loudest standing-O's of the night was for Athletic Director Tim Curley. Mr. and Mrs. Curley hosted the event, and the open bar - which drew the most applause! Barbara and I enjoyed ourselves immensely, reconnecting with old friends from past teams and meeting with some Icers players from before our time in Hockey Valley. It continues to be our honor to be a part of this family that is Penn State hockey. For the second year in a row, Mother Nature did her best to upset the Icers Alumni Day, but not this year. Terry and Kim Pegula and Cliff Benson spent three hours stuck behind a jacknifed semi on I-99, but arrived at the Greenberg Ice Pavilion just in time for Mr. Pegula to take part in the induction ceremonies of the Icers Hall of Fame Class of 2011. Of course, those ceremonies were pushed back from the first intermission to after the second period, but that doesn't matter in the grand scheme of things! While the shootout didn't go the Icers' way, the fact that it came to that means that PSU, for all intents and purposes, "won" alumni weekend. The Icers were not on their game on Saturday, but they kept battling back every time Rhody took a lead. Dom Morrone's highlight reel goal that knotted the score at 4 was simply the play of the year, at least to this point of the season. Unfortunately, Dave Macalino was the only shooter able to score in the shootout, giving the Rams the victory. With ninth-ranked Oklahoma taking two from #10 Oakland this weekend, and with the Icers facing Bobby Mo at home next weekend, there is the possibility that Penn State could move up a spot in the next rankings that will be released on the 18th. Barb and I had the pleasure of attending the Alumni dinner last night. Because of that and work commitments today (along with the length of time it takes to post videos to You Tube), I won't have the game highlights and Hall of Fame induction videos posted here until this evening at the earliest. The dinner was an incredible event - making me wish I had video to post. Well, at least the PG-rated parts! It was another big win for the Icers on Friday night, despite a second period meltdown. Freshman Andrew Duval, inserted into the lineup in place of the injured Mike Long, scored his first goal as an Icer in the third period as eleventh-ranked Penn State knocked off #6 Rhode Island 4-3 at the Greenberg Ice Pavilion. Dom Morrone and Nick Seravalli had staked the Icers to a 2-0 lead in the second before the guys stopped skating. Rhode Island scored three straight to take the lead, but Mike Broccolo notched his second of the season and second in two games to tie the game at 3 after 40 minutes. That set the stage for Duval's game winner - another goal scored by someone getting into the dirty area in front of the opposition net. Andrew's goal was witnessed by his dad, who caught a red-eye flight from Denver to make it to Hockey Valley in time to see the game. Today is Alumni Day, with the accompanying Hall of Fame inductions and a special surprise. The guys will have to concentrate for 60 minutes and avoid going to sleep as they did last night. With a win today and a sweep of Robert Morris next weekend, the Icers can claim a share of the ESCHL regular season crown. More importantly, it says here that a win today will cement their 20th straight appearance in the ACHA National Tournament. Ninth-ranked Oklahoma helped the Icers last night with a 6-1 drubbing of #10 Oakland, while #12 Iowa State blanked Div. II Kansas 9-0. This is the third straight weekend that the Cyclones have played a D-II squad. I'm not sure that will help their chances of making it to the dance, especially after struggling to win two last weekend against Colorado State. I'll get this out of the way right off the bat. Now that February is here - it is going to be so nice to be spending three out of the next four weekends at home! January was a tough month, with seven of the eight games away from the Greenberg Ice Pavilion. On the ice, the Icers were 5-3, including last weekend's huge split at Delaware. Saturday's 3-2 win at the Rust Arena may have been enough to secure a spot in the national tournament. We'll have a better idea when the new ranking is released on Friday. The Icers are "on the bubble" of making the ACHA National Tournament field for the 20th-consecutive time. A pair of victories would likely punch their ticket to the dance. Also in the balance is the ESCHL, regular-season title. If the Icers sweep the Rams (with at least one win in regulation) and sweep Robert Morris next weekend, they will be ensured at least a share of the ESCHL crown. If they sweep their remaining games and Delaware loses either of their games with West Chester the following week, the Icers will be sole owners of the regular-season title. The Icers have won at least a share of the league title since it was formed in 2007. On Tuesday, I spoke with Mike Broccolo and Dan Petrick. Mike scored the game winner on Saturday, just his first goal of the season, while Dan may have saved the Icers' season on Saturday after enduring a tough night on Friday. Both know the importance of this two-game series, and both know they'll have lots of support from what should be a full house for both games. Don't forget - Saturday's game has been moved up to a 2:00pm start from the normal 3:30pm faceoff. Officially, Mathew Madrazo was the first star of Saturday's 3-2 Penn State win over Delaware. Unofficially, interim head coach Josh Hand gets a first star nod as well. Josh, with the assistance of volunteer coach Will Gigante, ran a tight bench and had the guys believing that they could knock off the Blue Hens. This week, coach Hand is working to keep the confidence level up as the Icers prepare for two games with Rhode Island. In other news, the Buffalo Sabres have confirmed the worst kept secret in hockey (Ver. 2.0). Buffalo Sabres owner Tom Golisano agreed to sell the franchise to Pennsylvania businessman Terry Pegula on Tuesday. The team announced the agreement, but details were not released. Golisano and managing partner Larry Quinn have scheduled a news conference for Thursday. The Buffalo News reported the agreement, which is subject to league approval, includes $175 million US for the Sabres and an additional $14 million in liabilities. The sale still needs approval of the NHL.